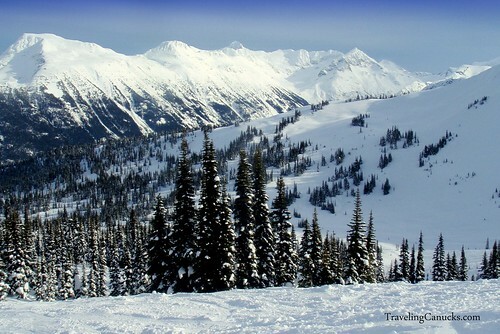 Whistler is a world class ski resort in British Columbia located about 125 km north of Vancouver. Though it has been a Canadian treasure for years, it gained huge international fame as the co-host of the successful Vancouver 2010 Winter Olympics. 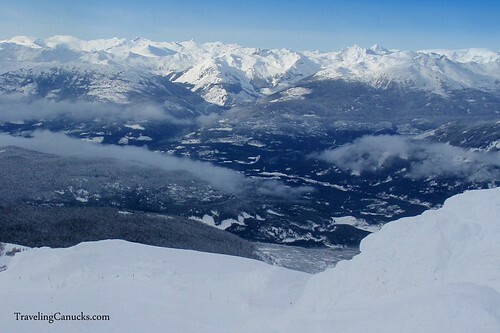 Whistler has consistently been voted among the top destinations in North America by major ski magazines since the mid-1990s, attracting over 2 million people annually. 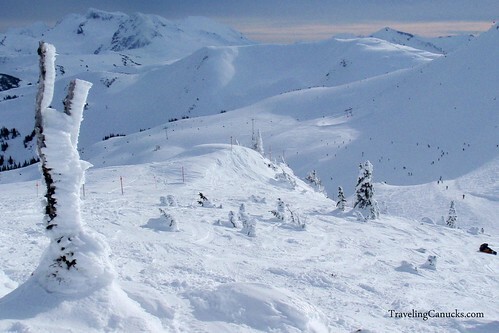 By many measures, Whistler-Blackcomb is the largest ski resort in North America with over 200 runs, 39 lifts and well over 8,000 acres of terrain. The recent addition of the record breaking Peak-2-Peak gondola now connects Whistler and Blackcomb Mountains, giving skiers and snowboarders quick and easy access to both mountains, while also creating a popular tourist attraction for those that aren’t in to mountain sports. 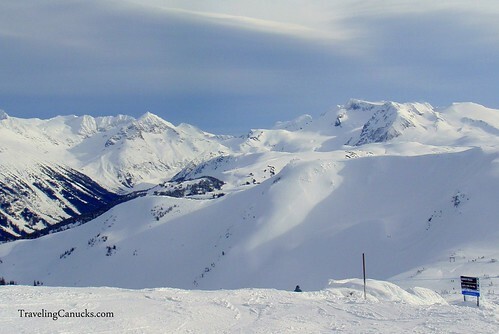 We’ve put together a collection of photos that we snapped this past weekend (Jan 22, 2011) while snowboarding Whistler Mountain. We were fortunate to have the morning overcast replaced by a warm, blue bird afternoon, resulting in some fantastic photo opportunities and an awesome day on the mountain! 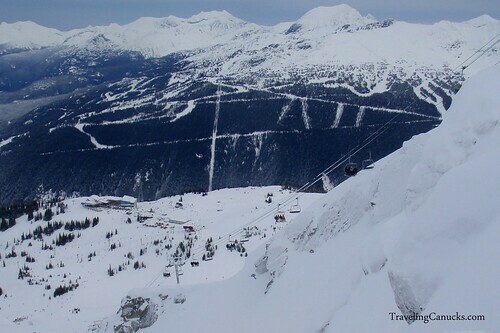 Mid-Station and Peak Chair Lift on Whistler Mountain. 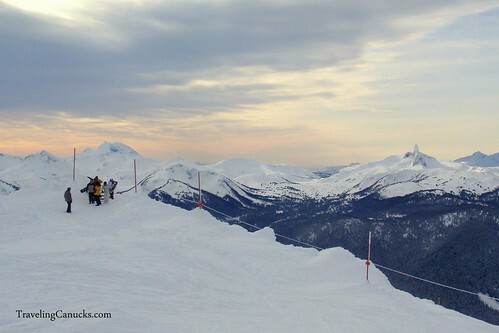 Blackcomb Mountain ski runs in the background. 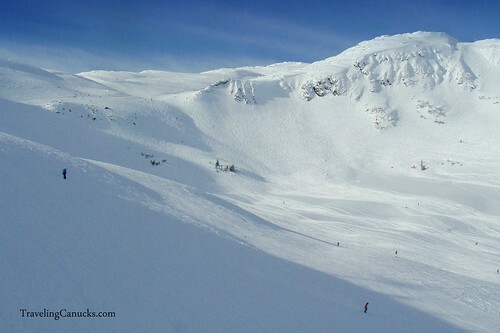 Symphony Bowl on Whistler Mountain. Unlimited space to play! How to do you get to Whistler? There are no commercial airports in Whistler, so if you are arriving by plane you will need to fly into Vancouver International Airport (YVR). There are buses, taxis and limo services that can transport you from Vancouver airport to Whistler Village. The cost to take a limo or taxi from Vancouver to Whistler will probably run you between CDN$200-$400, and that’s only one way. We recommend hiring a rental car and driving yourself, but keep in mind that most Whistler hotels charge about $20 per night for parking. The Sea-to-Sky highway that connects Vancouver to Whistler has been given a complete renovation, making it very easy to drive (plus, it’s one of the most beautiful and scenic highways in Canada!). 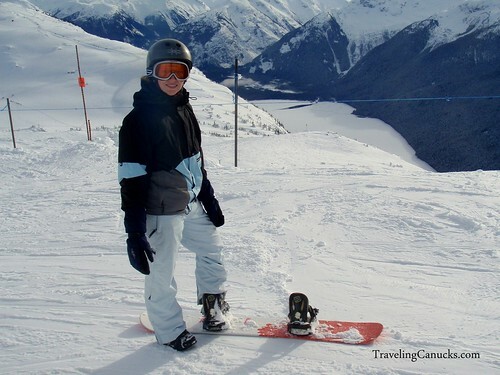 Thinking about a ski trip in Whistler? 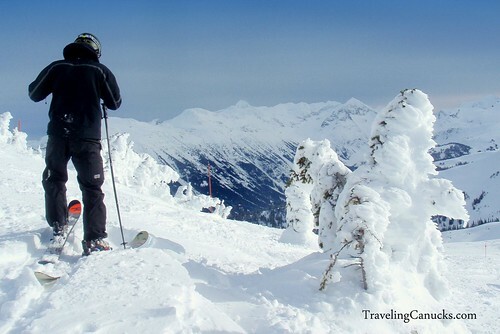 Have you visited Whistler? Where is your favourite ski resort? Share your feddback in the comments section below! What an awesome-looking mountain. If our time here until our RTW April isn’t already filled with ski trips to Tahoe with friends and relatives, we’d be really tempted to make a weekend ski trip north. Favorite winter destination? Well, Yosemite and the Sierras of course! Hey guys – thanks for stopping by! Never been to Yosemite or Sierras but we’ve been thinking about doing a USA roadtrip that would include both. Likely in the summer months though, so we can camp. We’ve never actually been snowboarding in the States, other than Mount Baker but that’s practically BC anyways. My brain and my fingers freeze only looking at these pictures, but I tweeted and stumbled. I don’t know how to snowboarding so for me to ever get these type of shots is proably never. So glad I can see it from your post. 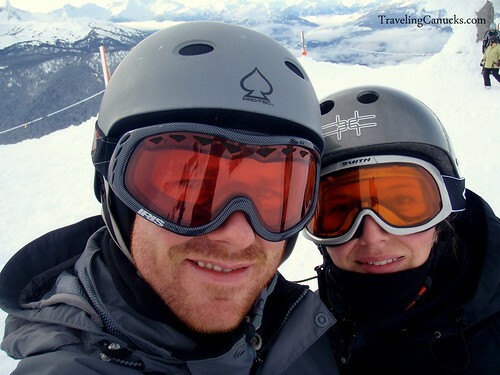 They’re beautiful and seems like you guys had tons of fun at Whistler! Great photos! I love that you can feed birds right on the lift line. Looks like an amazing place to ski and snowboard. 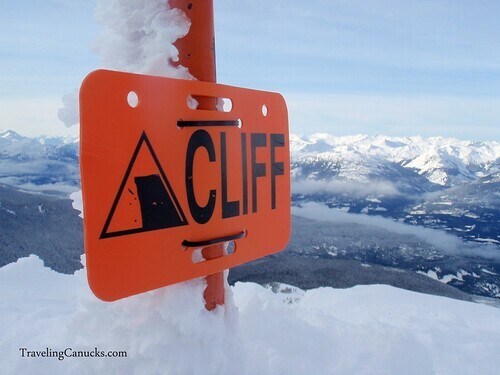 Being adventurous Canucks, are you advanced snowboarders? What great looking mountains. It looks like a fabulous place to hang out for a while. I love the shot of the bird too. Amazing! We were lucky to have the weather cooperate with us that day. A clear day opens it right up, giving you snow-capped mountains for miles in every direction. Amazing. 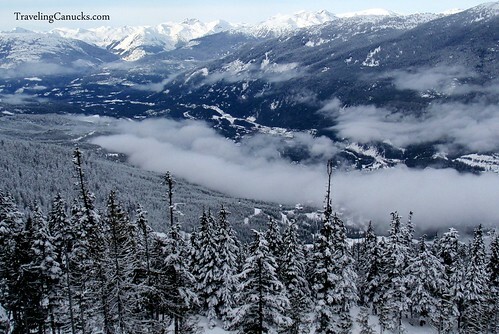 Whistler looks wonderful — have to ski there sometime. However, I have to admit that I’m just an intermediate type skier and a couple of the pics of Symphony Bowl look a little scary. I mostly ski at Northstar at Tahoe (really good skiers have referred to it as Flatstar, but it’s got plenty of challenges for me). We also love to stay at the kind of rustic ski-on/ski-off condos there – very comfortable. Oh don’t worry about your ski level, there are so many runs and sections for all skill levels. These shots were from the peak and bowls, which you’d likely stay away from if it makes you nervous. Beginner to intermediate skiers would stick to about mid-mountian terrain, where there are loads of green runs and less vertical drop. There are a lot of ski-in/ski-out accomodations on the mountain, but most of the rustic condos and cabins are located just outside the village. Hopefully you’ll get a chance to check it out someday – I’m confident you’d loved love it! Sounds great. Where are you guys now? 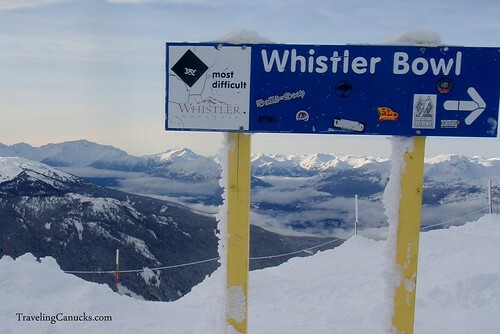 I’m a skier, but have sadly not made it to Whistler. Guess I got lazy living in Calgary with Banff and Lake Louise so close, but I really want to get there, I’ve heard it’s fantastic! last year we drove up and did some back country skiing at the newly opened olympic nordic center. It was awesome. I can’t wait to go back. Did you stay at the Chateau Whistler? That’s a great hotel. I don’t ski, or snowboard, but these pictures are fantastic. I love looking at mountain pictures, even though I perpetually complain about winter and the show. The feeing the bird shot is really cool. The birds are pretty cool, but freaky. If you’re not aware of them (which many people are not), they will try to take your food if you’re snacking in the chair lift line. They are so used to people that they are not afraid. Sometimes they come at you pretty fast and scare the crap out of you! exposure on snow and ice shots are tough — these (as usual) are great shots. Thanks for sharing. What an incredible looking place. Living in Missouri, we don’t get too many skiing/snowboarding opportunities, but we have been to Colorado several times to ski, and we LOVE it. I’d love to get up there sometime in the future. And wow, those pictures are just awesome. The last one is my favorite. There’s just something about the ruggedness of snow-covered mountains. I just love them!! This winter has been so snow packed (at least here in the east coast). That means it is a MUST for me to go skiing or snowboarding. Whistler looks really beautiful. OMG guys- gorgeous photos!!! i was getting chilly just looking at them, but on the other hand the place looks so beautiful it definitely seems worth bundling up for. and that bird photo?! unbelievable. i really want to try snowboarding! Thanks Lorna! I got pretty lucky with the bird photo… it came in so fast, I was barely got the shot off in time! My favorite winter destination? Quebec, Canada. I wish I was there now for the winter carnaval. My favorite pic above is the one of the bird. That’s one spoiled bird! Whistler is literally one of my favorite places in the world. I have been snowboarding for years but I have to admit I was first introduced to Whistler on “College Weekend” when I bunch of underage college kids take advantage of the low Canadian drinking age and play in the snow. I have visited multiple times per year and the couple of times I couldn’t afford a lift ticket were very sad but I have been able to snowboard AND enjoy the bar scene almost every visit. We spent NYE 2008 and 2009 at Merlin’s Bar and met tons of great people! Ah yes, good ol’ Merlins! Cheap jugs of beer and a mountainous serving of nachos… good times! We often stay in Upper Village so Merlins is our watering hole of choice. Great shots. I just cross country skied for the first time last weekend at the Callaghan Valley and was super impressed by what it had to offer. Close to Whistler (13 kms away) but if felt like a different world. I’ve heard it is a fantastic course. I’ve been meaning to give it a go for a while but can’t seem to find the time. The last time I went cross country skiing was probably 15 years ago though, so I’ll need a tune up! Amazing photos my friends. You look like you’re having the time of your lives. 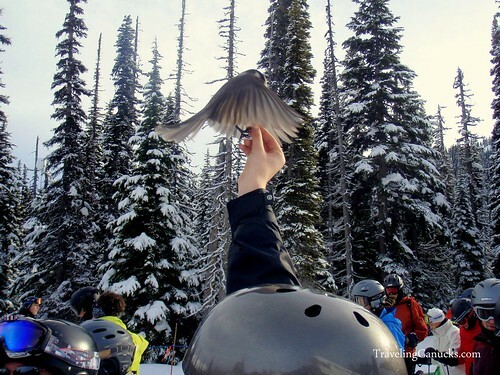 I love the photo of feeding bird while in line..incredible shot…such grace and poise frozen in time in a memorable pic!! Great job!!!! Thanks Jeff! I’m very happy with how that bird feeding picture turned out. Literally a split second and he was gone. Gorgeous! There is nothing like the beauty of snow covered mountains. It seems like you can truly find those places of isolation at the top of the world, it would seem. Hi guys, great pics….I can never stop looking at pics of snow! Do you have any tips on places to stay, or even things to do other than snowboarding?? Also, with the poor Feb whether last year, hows things looking at the moment….a white long season? Awesome! Sorry for the late response… yes, we have lots of recommendations! Send us a note through the contact form. I’m new to Canada – you have it so good here in terms of snow! Great photos guys! LOVE the one with the bird! You guys actually make me want to ski…I’m a surf gal! Great shots! Amazing photos, guys! Unfortunately ski terrifies me! Thanks for the pics, I enjoyed them! 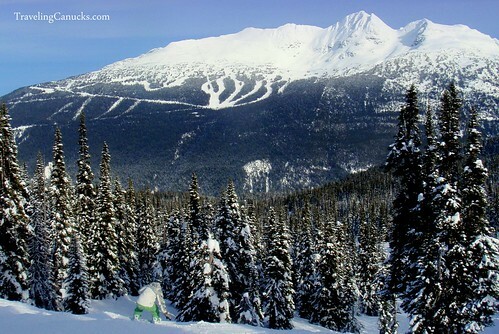 Not to over sell it, but you’re going love Whistler!